The Centrally Sponsored Scheme for Integrating Persons With Disabilities in the Mainstream of Technical and Vocational Education was initiated by the MHRD, Govt of India during 2000. The scheme aims at providing equal opportunities to persons with disabilities [PWDs] in selected polytechnics across the country. 50 polytechnics were identified for implementing this social sector scheme. Each identified polytechnics is required to admit 25 PWD students in formal programmes every year and train 100 PWDs through non-formal skill development training programmes every year. The four NITTTRs act as a resource system ensuring effective implementation of the scheme in their respective regions. The progress of the scheme is monitored by the four NITTTRs and reported to the MHRD, Govt of India from time to time. The scheme has provided ample opportunities to PWDs who intend to pursue technical and vocational education in the institutions implementing the scheme. MHRD, Govt of India provides liberal financial assistance to PWDs admitted to formal and non-formal programmes under the scheme. 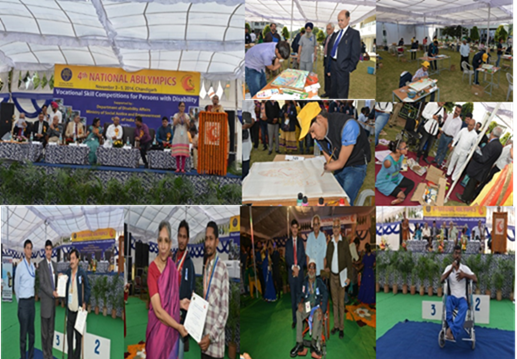 During the year 2014, 4th National Abilympics was oragnised by National Institute of Technical Teachers Training and Research, Chandigarh in collaboration with NAAI, Delhi at its campus from 3-5 November. 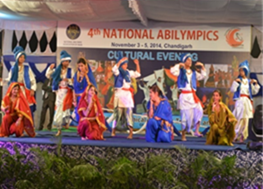 Organisation of Abilympics provided an opportunity to the institute administration, faculty, staff and students to understand the importance of accessible infrastructure from the view point of persons with disabilities.The institute, keeping in view the requirement of accessible infrastructure by Persons with Disabilities and also the thrust of the government in making education and training institutions barrier free, decided to make its entire campus accessible by Persons with Disabilities. Keeping in view the policy initiatives of Government of India, the institute got the access audit conducted. Subsequent to conduct of access audit, following developments have taken place at the institute. 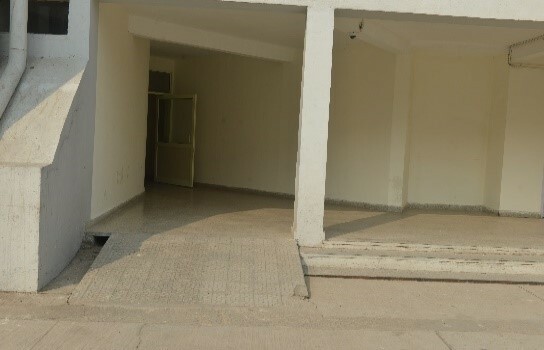 A ramp already exists in Homi Bhabha Academic Block of the institute and connects all the floors of this four storeyed building. 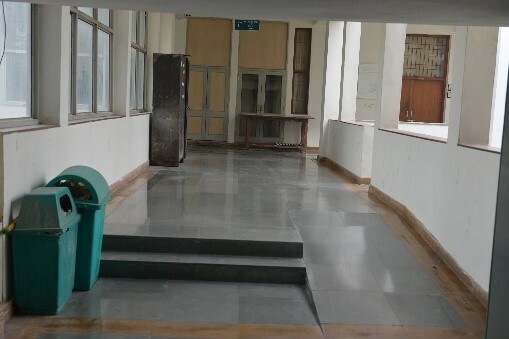 This ramp also connects all floors of the old hostel, which is now named as Chandrasekhar Hall. 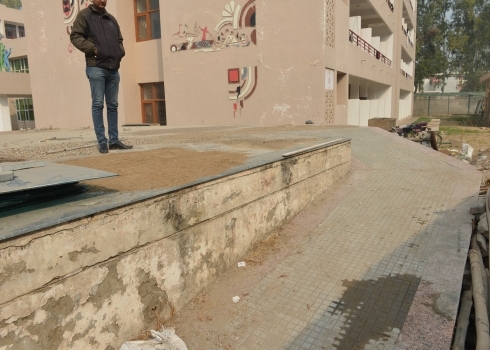 A ramp near the auditorium has been constructed to ensure barrier free access to Homi Bhabha Academic Block. A ramp has been constructed at the entrance of Ramanujan Centre for Computer Science and Educational Television. The Multipurpose Hall of the institute also has ramps on both the sides on its entrance. This hall is the most visited facility of the institute. Institute students, teacher trainees, faculty, staff and guests utilise Multipurpose Hall for dining, GYM and entertainment facility. Ramp has been constructed to ensure accessibility to persons with disability on the open air stage. This facility will provide an opportunity to PWDs to take part in cultural events organised from time to time. Construction of ramp outside Sir JC Bose Academic and Administrative Block was done to ensure free access to PWDs when they want to visit Director’s office, Administration and Accounts, Institute Library, Curriculum Development Centre, Entrepreneurship Development and Coordination Department and Education and Educational Management Department of the institute. 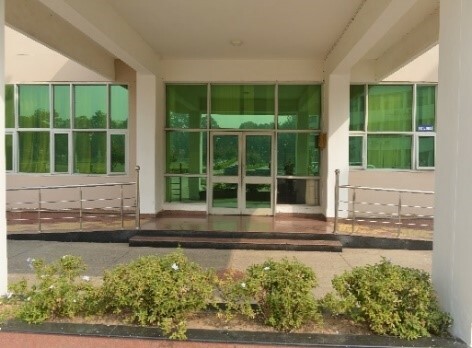 Har Gobind Khorana Guest House of the institute has ramps on both sides of its main entrance. 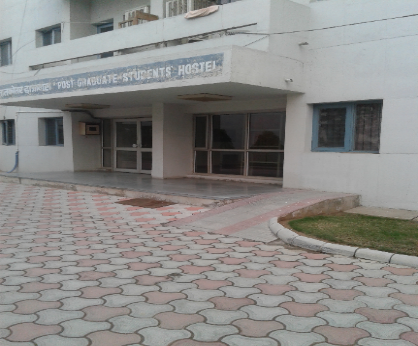 A ramp has been constructed at entrance of Raman Hall (PG Hostel). 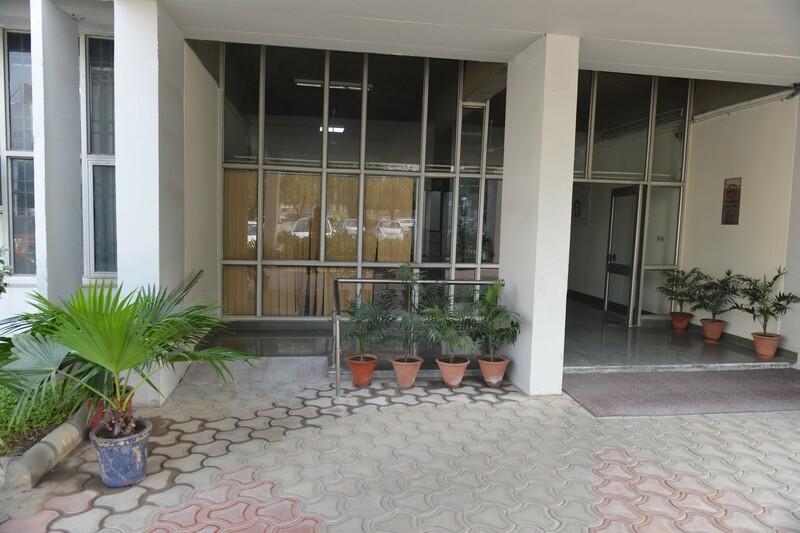 A ramp has been constructed to connect the Homi Bhabha Academic Block and Visvesvaraya Lecture Hall to ensure access to persons with disability. A ramp has been constructed to ensure barrier free access to Persons with Disabilities to SS Bhatnagar Auditorium. Ramps have also been provided on both sides within the auditorium so as to enable wheel chair users reach any of the rows in the institute auditorium. 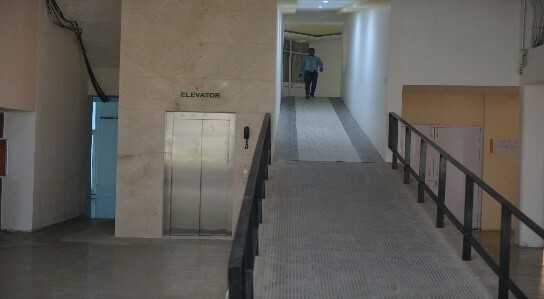 Elevators have been provided in newly constructed hostels namely; Amartya Hall and Tagore Hall. Persons with Disabilities can reach all floors of the hostel independently. During 2016, three elevators, one each in Homi Bhabha Academic Block, Sir J C Bose Academic and Administrative Block and Ramanujan Centre for Computer Science & Educational Television. The elevators have been provided at a cost of Rs. 45 Lakhs. Ministry of Social Justice and Empowerment, Government of India made available grant for this purpose. A toilet has been constructed having a door width of 3 feet to ensure free access to wheel chair users. This toilet is used by PWDs and also serves the purpose of a demonstration unit. Taking clue from NITTTR, other institutions interested in constructing special toilets, can go ahead with creating similar facility, in their respective institutions. 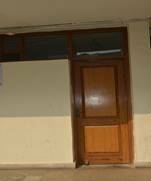 Two special toilets on each floor of four storeyed Amartya Hall and Tagore Hall have been provided for gents with Disabilities. One special toilet on each floor of four storeyed Mother Teresa Hall has been constructed for ladies with disabilities. 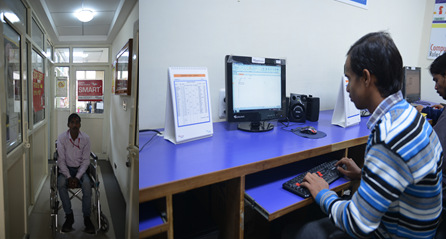 The accessibility of institute website is under process as the institute has already received a sum of Rs. 20.00 lakh from Ministry of Social Justice and Empowerment, Government of India to make the institute website accessible for persons with disabilities. Tenders have been floated for making the website accessible for the persons with disabilities. The website will soon become accessible for persons with disabilities. It would be a rare facility and act as a demonstration website for those who want to make their website accessible for persons with disabilities. Smart Centre for Vocational Training of Persons with Disability A smart centre for vocational training of Persons with Disabilities has been established at the institute in collaboration of Tech Mahindra Foundation and Sarthak Educational Trust. Persons with disabilities are provided vocational training for employment in Hospitality Sector, Information Technology and Business Process Outsourcing sector, Retail Sector and Manufacturing Sector. 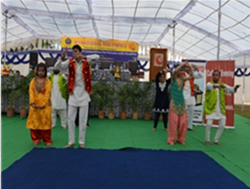 More than 500 Persons with Disabilities have so far undergone training and approximately 75% of them have been placed in organisations located in and around Chandigarh. The programme beneficiaries are helped in personality grooming, English communication, numeracy skills, computer skills, computer literacy and life skills.Subsequently, they are provided sectors specific skill training which enables them to seek employment in targeted sectors. This initiative has received a lot of appreciation from different quarters and promotes inclusion of PWDs at work place. Promoting inclusion at work place and empowering PWDs through placement is on the top of the agenda of the institute. Every year the institute organises a number of job fairs in collaboration with Confederation of Indian Industry, Sarthak Educational Trust and other stakeholders. The job fairs are an attempt to ensure employment to the persons with disabilities according to their residual capabilities. 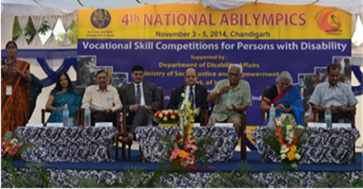 During past six years 16 job fairs have been organised resulting in placement of more than 400 Persons with Disabilities in and around Chandigarh.